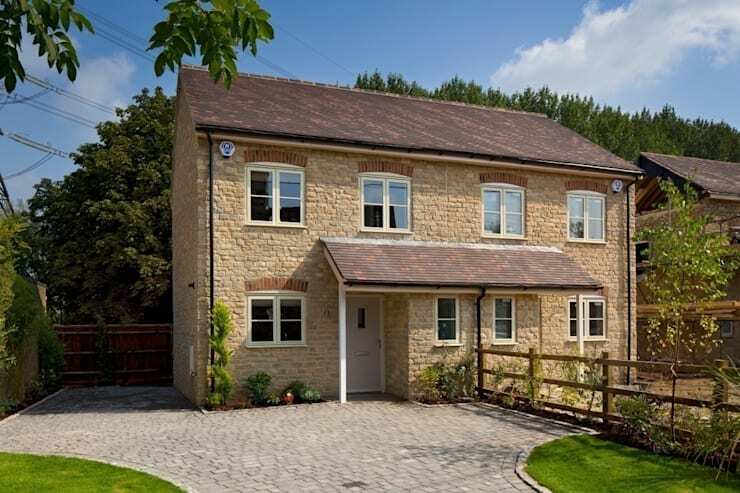 This beautiful cottage in North Hinksey, Oxforshire, looks like a traditional stone cottage that could have been around for hundreds of years, but the truth is, this quaint little house is a new build. As you soon will see, the interior is a prime example of tasteful and elegant modern design, courtesy of Emma & Eve Interior Design . Let's take a closer look. As we approach the house, we're greeted by a beautiful country style exterior that exudes a pleasant and welcoming aura. The neat brickwork at the front, as well as the simple but attractive front courtyard, make the home look fresh and well cared for. With a flourish of green framing the façade, the finished result draws us inside and makes us curious as to what secrets the interior holds. 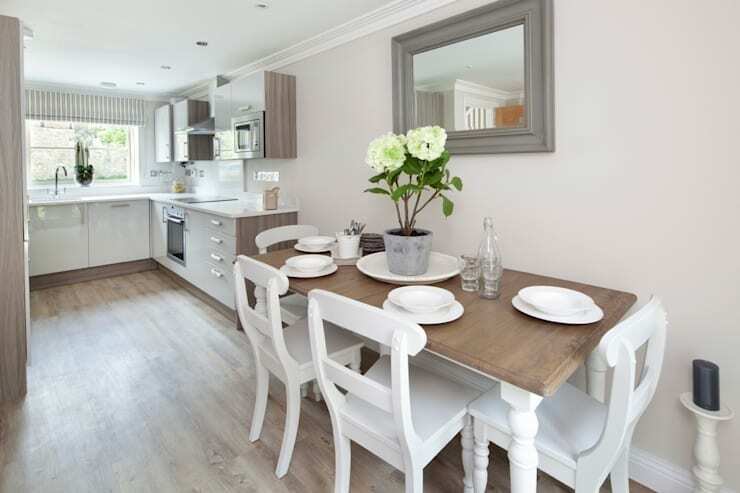 White interiors never go out of fashion, and can make small rooms look endlessly spacious and bright. 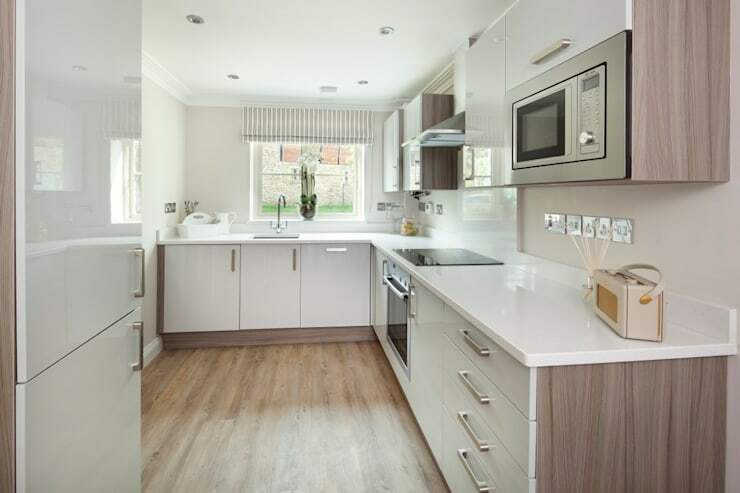 The neutral colour scheme chosen by Emma & Eve really pays off in this modern kitchen, which boasts well integrated, state-of-the-art appliances and all the mod cons a budding chef could possibly require. The pale timber floorboards compliment the detailing on the side of the kitchen cabinets, creating continuity in the design. Overall, each element works wonderfully in the kitchen to create a down-to-earth but beautiful and sophisticated space for cooking and entertaining. The dining room leads off from the kitchen and maintains the same colour scheme and design. White chairs and a contemporary dining table with contrasting timber top and white legs dominate the space. The table has already been set with classic tableware, and an understated flower provides a tasteful centrepiece which draws the eye. 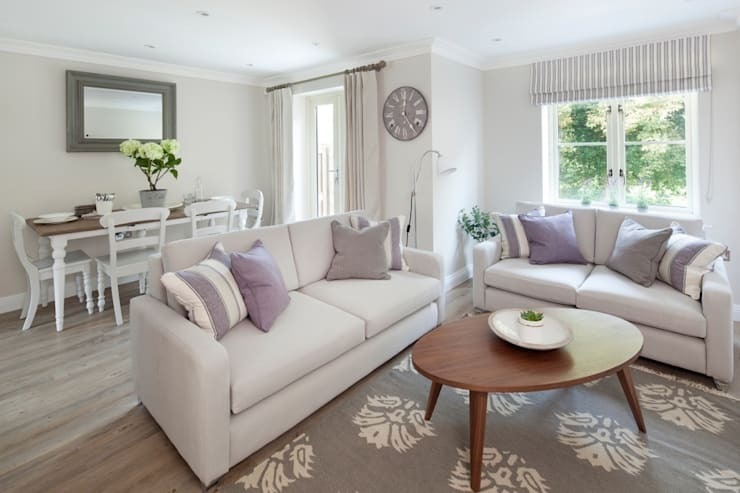 Above, a simple mirror with a powder grey border adds a touch of traditional charm to the area and also opens up the space thanks to its reflective quality. We absolutely love this elegant and feminine living room, decorated in a modern-meets-classic style. The fundamental design is simple, with off-white walls, cream couches and traditional wooden floorboards providing the backdrop. A patterned rug in neutral grey and cream tones sections off the living area, which is part of a larger, open plan space. The same shade of grey is seen in the window blinds and the vintage style wall clock, again establishing a connection between every aspect of the interior. The bedroom is a relaxing haven of cosy fabrics, fresh colours, and plenty of natural light. 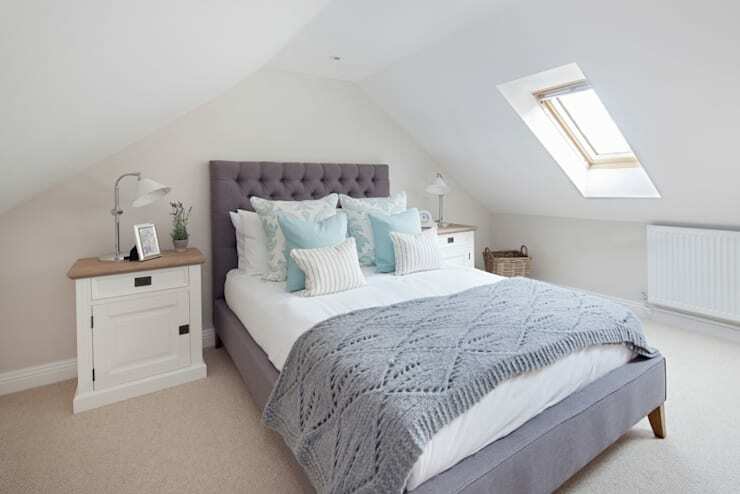 The layout tackles the issue of the pitched roof, incorporating smaller and shorter items of furniture rather than tall wardrobes which would make the room look crowded. Carpet has been chosen to create a cosy atmosphere; the softness of carpet is best suited to the areas in which you want to relax and unwind after a long day. Again, the same tricks we saw on the ground floor have been employed here as well; white walls and furniture make this room look bigger and brighter, creating a greater sense of space. Quality and style reign supreme in the bathroom. The room is quite large in relation to the others, but the illusion of even more space has been created thanks to the clever layout, light colours and the seamless integration of the facilities. 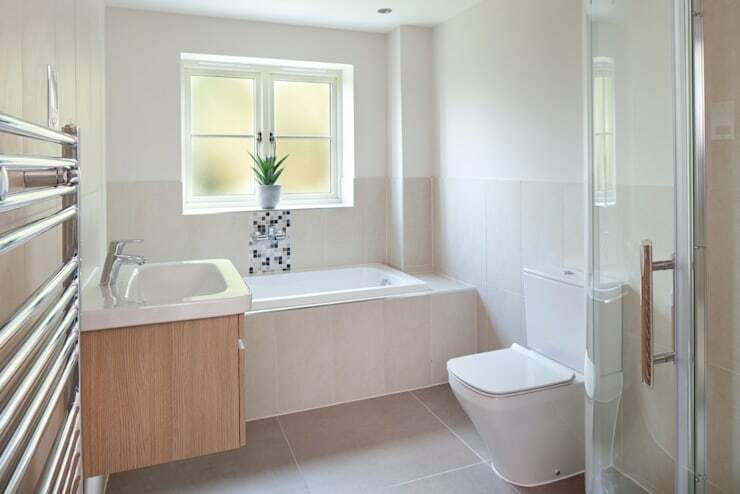 The tiles are a stylish and practical choice, as they are easy to clean and keep the bathroom fresher for longer. A simple metallic pattern in the centre of the wall gives the room a lift and adds a touch of sparkle. For a similar project, why not check out the following ideabook? New build with old-time charm.